This post is about attitude, and not just any attitude, it’s about your attitude. I wonder how many people reading this post have a positive attitude? Do you? Most people would answer with a resounding yes, so I’ll assume that most people reading this post have a positive attitude. So let me ask you this question – what are some things that can have an effect on your attitude before you even get to work in the morning? Think about that for a moment. Now STOP. STOP right there! Do you realize that you’ve just been given a choice? It’s a choice you’re given every single day, and I’ll bet you didn’t even realize it was a choice. Now since most people reading this post have a positive attitude, what are the things you thought of when given that choice? Are you surprised by what you thought of? Notice I didn’t say what can have a negative effect on your attitude I just said what can have an effect on your attitude, you had a choice. What did you choose positive or negative? I know from experience that the vast majority of “positive” people thought of something negative. That’s a choice you have the opportunity to make constantly throughout the day. It’s amazing how many people surrender that choice to other people or other things… the kind of things many of you just thought of when given a choice. Authentic leaders realize that every interaction with a person leaves that person feeling either better or worse, there are no “attitude neutral” interactions. 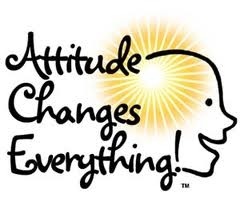 So, will you be a positive force with your attitude, or will you be a negative force with your attitude? If you’re leading people that have less than a positive attitude, the first place to look for the source of their poor attitude is in the mirror. Their attitude is most commonly a reflection of yours. Authentic leaders are a positive model for their people. You can tell your people to have a positive attitude or you can show them how to have a positive attitude, the choice is yours. Choose well this week and notice the difference in you and your people. Reblogged this on brilliant MENTOR's working. One easy habit is to wish nothing but the best for the other person. I learned this from Og Mandino as well as the new book on EI, Search Inside Yourself. Have the mindset that you want the other person to be happy. It’s amazing how your persona changes. You’ll feel better and you’ll also be giving serotonin hits to the other person. If you’re a leader, have the one thought that your subordinate is going to do a fantabulous job on the project you assigned. If you approach them in a manner that’s any less then extraordinary, you’ve already broken the relationship. Great thoughts Steve. I will try to focus on that more… We do tend to get what we expect from our people. This is a great post! Not often do we think of the impact we have on others’ attitude! Thanks for the reminder! Indeed, our attitudes are contagious whether they are good or bad. We need to make certain we’re “spreading” a good one!